In normal conditions at the cellular level, there is a balance between the production of free radicals and antioxidant activities. The antioxidant system consists of both enzymatic and nonenzymatic parts such as superoxide dismutase (SOD), catalase, glutathione peroxidase (GPx), glutathione reductase (GSH-Rd), and glucose-6-phosphate dehydrogenase (G6PD or G6PDH)., The SOD enzyme is in the first line of defense against oxidative damage which converts superoxide to H2O2 and O2. Similarly, GPx is also a natural enzyme, which reduces hydrogen peroxide and catalyzes a wide range of organic peroxides to the relevant alcohol and water. Suppression of these enzymes is one of the main reasons for massive oxidative damage following exposure to ionizing radiation. Several studies have introduced melatonin as a proper immunostimulator and radioprotector for the amelioration of oxidative damage at the directly irradiated site., Melatonin is able to scavenge free radicals directly or through its stimulatory actions on antioxidant enzymes activity, inhibitions on pro-oxidative enzyme activity, and protective effects on macromolecules. Lipid peroxidation has an important role in destruction and damage to the cells. The process of lipid peroxidation involves oxidative conversion of polyunsaturated fatty acids to several products such as malondialdehyde (MDA). MDA, being an end product of lipid peroxidation, serves as an index of oxidative damage, and because of its high cytotoxicity and inhibitory actions on protective enzymes, it acts as a tumor promoter and a cocarcinogenic agent. In this study, the effect of pretreatment with melatonin on the MDA level (as index of lipid peroxidation) and SOD and GPx enzyme activities was evaluated in targeted and nontargeted lung tissues exposed to γ-rays. The experimental protocol was in line with the guidelines for care and use of laboratory animals as adopted by the Ethics Committee of the School of Medicine, Tehran University of Medical Sciences, Tehran, Iran. Eight- to ten-week-old male Wistar rats, each weighing 180–200 g, were obtained from Tehran University Animal Facility, School of Medicine, Tehran University of Medical Sciences, Tehran, Iran. They were housed in the animal facility, with the room temperature maintained at 20–22°C, a relative humidity of 50%–70%, and an airflow rate of 15 exchange/h. Furthermore, a time-controlled system provided 08:00–20:00 h light and 20:00–08:00 h dark cycles. All the rats were given a standard rodent chow diet and water from sanitized bottle fitted with stopper and sipper tubes. Irradiation was performed using a 1.25 MeV cobalt-60 γ-radiation source at a dose rate of 101 cGy/min with a source-surface distance of 60 cm and fixed field size of 3.75 cm × 3.75 cm for localized body irradiation at room temperature (22 ± 2°C). Scattered radiation dose received by the lung at the localized pelvic irradiation was measured using rat phantom (plexiglas and cork as a lung soft-tissue equivalent) and TLD100 dosimeter. The measured scatter dose at the lung tissues equivalent after localized irradiation of the pelvis was approximately 18 cGy. The lung tissues were perfused with a PBS solution (pH = 7.4), containing 0.16 mg/ml heparin to remove the red blood cells and clots. Then, the tissues were weighted (100 mg tissue per 1 ml PBS buffer) and homogenized (thoroughly by homogenizer at 5000 rpm for 20 min). The supernatant was carefully collected and used to quantify GPx, SOD, and MDA with a kit (Zellbio, Biocore, Germany). The GPx and SOD activity and the MDA level were measured with ELISA reader (calorimeter) at 412, 420, and 535 nm according to the manufacturer's instruction. Each data point represents the mean ± standard error of the mean of at least five animals per group. A one-way analysis of variance was performed to compare different groups, followed by Tukey's method. P < 0.05 was considered as statistically significant difference. GPx activity in nontargeted, whole-body scatter and localized direct irradiation to lung group increased significantly (P < 0.001) in comparison to the control group, although increased GPx activity for localized direct irradiation to lung was lower than the other two groups (P < 0.001). GPx activity in the nontargeted irradiation group showed a significant increase (P < 0.05) compared with the scatter group. Treatment with melatonin 30 min before irradiation decreased the GPx activity in targeted and nontargeted lung tissues (P < 0.001) [Figure 1]a.
SOD activity in X-irradiated (targeted and nontargeted) lung tissues and also the scatter group increased significantly (P < 0.001) compared with the control group, although SOD activity in nontargeted group was lower than the scatter group (P < 0.05). Treatment with melatonin 30 min before irradiation decreased the SOD activity in targeted but not for nontargeted lung groups (P < 0.001) [Figure 1]b.
MDA level in X-irradiated (targeted, nontargeted, and scatter groups) lung tissues increased significantly (P < 0.001) compared with the control group. Results showed that there is no significant difference in the MDA level between these groups. Treatment with melatonin 30 min before irradiation reduced the MDA level for both targeted and nontargeted groups (P < 0.05) [Figure 1]c.
In this research, it has been demonstrated that administration of melatonin before irradiation caused a significant reduction in oxidative stress in both targeted and nontargeted lung tissues. It was shown that direct irradiation to the lung resulted in an increase in the MDA level and GPx activity in both targeted and nontargeted lung tissues. Direct irradiation leads to an increase in SOD activity, whereas nontargeted effect suppressed the SOD activity. Inhibition of antioxidant enzymes such as SOD in bystander cells has been demonstrated in some studies. These studies indicated that transforming growth factor beta 1 (TGF-β)–miR-21 pathway has a key role for suppression of SOD level and increased ROS. The results presented in this report indicate that melatonin is able to ameliorate oxidative damage in both targeted and nontargeted lung tissues. The radioprotective effect of melatonin for targeted lung tissues was associated with reduced SOD and GPx activities. These results are in contrast to several previous studies. The altered level of antioxidant enzymes is dose dependent. Reduction in SOD activity and GSH levels has been demonstrated following exposure to high doses (18 Gy), but at a lower-dose (3 Gy), an increase in the levels of these enzymes was reported. Moreover, previous studies have indicated that SOD activity and GSH level were suppressed in nontargeted cells., These studies indicated that increased level of oxidative damage in nontargeted tissues reach the peak 24 h after exposure. These results are in line with the results of this study. Previous studies have shown that melatonin is able to mitigate micronuclei formation in bystander cells. In addition, in an in vivo study, melatonin has been shown to reduce inflammatory markers including COX-2 and iNOS in nontargeted lung tissues. Given that the production of free radicals in both targeted and nontargeted tissues has a potent relation to inflammatory responses, it seems that both antioxidative and anti-inflammatory effect of melatonin are involved in this process. Moreover, inhibition of some signaling pathways in nontargeted effect such as TGF-β–mir-21 or TGF-β–COX-2 may be involved in radioprotection by melatonin. The previous studies confirmed that inhibition of these pathways result in abolished oxidative stress and DNA damage.,, Given that melatonin has been shown to ameliorate increased TGF-β after irradiation, it is possible that suppression of TGF-β–mir-21 is involved in the upregulation of SOD activity after treatment with melatonin. In addition, suppression of ROS-producing enzymes such as COX-2 by melatonin can help to reduce the oxidative stress. Radioprotection of both targeted and nontargeted tissues by melatonin may help to reduce the risk of second primary cancers in patients undergoing radiation treatment for their diseases. The differences observed in the present study compared to those reported by others may be attributed to the differences in the experimental conditions, and hence, direct comparisons are not possible. Exposure to gamma rays with 5 Gy causes upregulation of oxidative damage. This was associated with increased SOD and GPx activities in targeted tissues and decreased SOD and GPx activities in nontargeted lung tissues. Melatonin could ameliorate oxidative stress in both the targeted and nontargeted lung tissues. Tehran University of medical sciences, grant number: 31495. 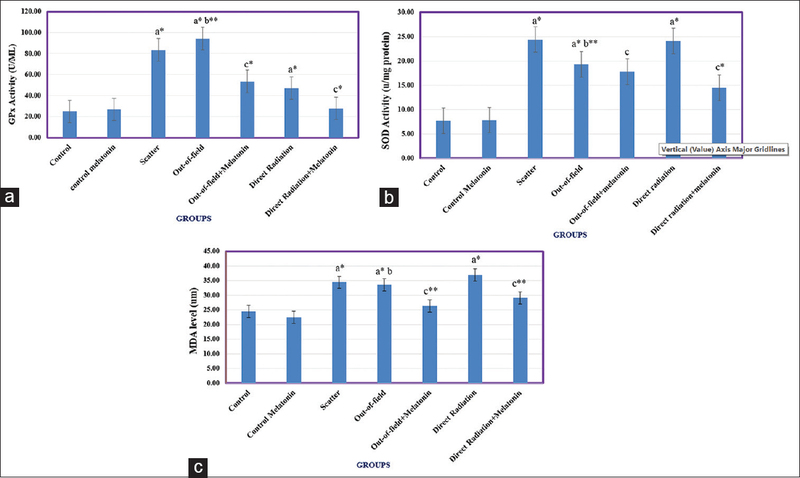 Fardid R, Najafi M, Salajegheh A, Kazemi E, Rezaeyan A. Radiation-induced non-targeted effect in vivo: Evaluation of cyclooygenase-2 and endothelin-1 gene expression in rat heart tissues. J Cancer Res Ther 2017;13:51-5. Morgan WF, Sowa MB. Non-targeted bystander effects induced by ionizing radiation. Mutat Res 2007;616:159-64. Chai Y, Lam RK, Calaf GM, Zhou H, Amundson S, Hei TK. Radiation-induced non-targeted response in vivo: Role of the TGFß-TGFBR1-COX-2 signalling pathway. Br J Cancer 2013;108:1106-12. Wang TJ, Wu CC, Chai Y, Lam RK, Hamada N, Kakinuma S, et al. Induction of non-targeted stress responses in mammary tissues by heavy ions. PLoS One 2015;10:e0136307. Mihandoost E, Shirazi A, Mahdavi SR, Aliasgharzadeh A. Consequences of lethal-whole-body gamma radiation and possible ameliorative role of melatonin. ScientificWorldJournal 2014;2014:621570. Chen J, Bhandar B, Kavdia M. Interaction of ROS and RNS with GSH and GSH/GPX Systems. FASEB J 2015;29:636.7. Najafi M, Shirazi A, Motevaseli E, Rezaeyan AH, Salajegheh A, Rezapoor S. Melatonin as an anti-inflammatory agent in radiotherapy. Inflammopharmacology 2017;25:403-13. Taysi S, Koc M, Büyükokuroglu ME, Altinkaynak K, Sahin YN. Melatonin reduces lipid peroxidation and nitric oxide during irradiation-induced oxidative injury in the rat liver. J Pineal Res 2003;34:173-7. Fardid R, Salajegheh A, Mosleh-Shirazi MA, Sharifzadeh S, Okhovat MA, Najafi M, et al. Melatonin ameliorates the production of COX-2, iNOS, and the formation of 8-OHdG in non-targeted lung tissue after pelvic irradiation. Cell J 2017;19:324-31. Jiang Y, Chen X, Tian W, Yin X, Wang J, Yang H. The role of TGF-ß1-miR-21-ROS pathway in bystander responses induced by irradiated non-small-cell lung cancer cells. Br J Cancer 2014;111:772-80. Xu S, Wang J, Ding N, Hu W, Zhang X, Wang B, et al. Exosome-mediated microRNA transfer plays a role in radiation-induced bystander effect. RNA Biol 2015;12:1355-63. Tian W, Yin X, Wang L, Wang J, Zhu W, Cao J, et al. The key role of miR-21-regulated SOD2 in the medium-mediated bystander responses in human fibroblasts induced by a-irradiated keratinocytes. Mutat Res 2015;780:77-85. Marozik P, Mothersill C, Seymour CB, Mosse I, Melnov S. Bystander effects induced by serum from survivors of the Chernobyl accident. Exp Hematol 2007;35 4 Suppl 1:55-63.